The software’s creation was based on the idea to invite professionals from around the world to join their own virtual design room, where they can create and visualize their artwork in 3D. The user simply selects his preferable packaging solution, among the wide range of Thrace Group products provided in the 3D Studio, and then customizes it in terms of color and creative artwork. 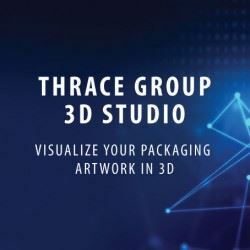 Thrace Group 3D Studio is a software that supports the creative freedom, yet is designed to be easily accessed and navigated, even by unskilled first time 3D technology users. Also, there is no need to install any supportive software on your computer to access the 3D Studio, just create your unique account and log in.